Instant pot is one of the newest additions in my kitchen. And this made a tremendous change in my cooking style interestingly. 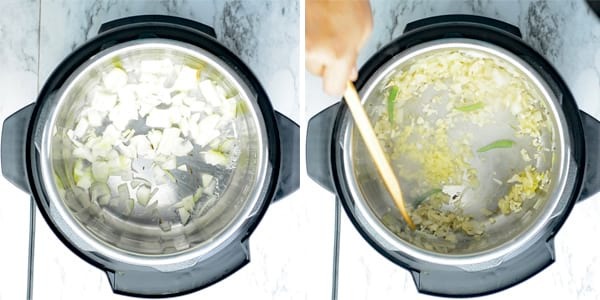 It is less fuzzy when compared to the traditional pressure cooker. And the results are fantastic every time we make. Furthermore, Instant pot has delay timer a game changer, which also gives complete control. 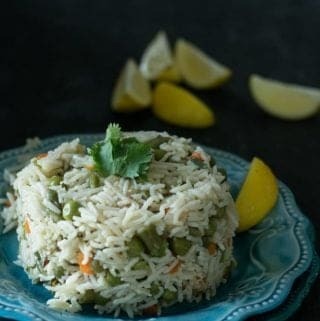 You make this Instant pot vegetable pulav within 30 minutes from scratch. Vegetable pulav, a best comforting recipe to make for the lunch box in the morning busy hours. It is straightforward, just set the timer and start focusing on other stuff. This simple Pulav, easy to make and as tasty as regular biryani. Everyone in our family loved it. Spicier kurma will make a perfect combo for this recipe. 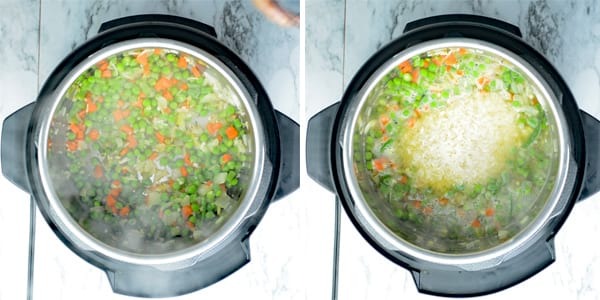 **This post is updated on 12/5/18 with Instant pot method, pictures and video. This simple recipe comes handy, this method of pulav is the right choice, with few minutes of processing time, I’m done with today’s work. But this recipe is nowhere compensate on its taste or flavor. This vegetable pulav is as tasty as regular biryani. Everyone in our family loved it. Spicier kurma will make a perfect combo for this recipe. Serve it with kurmas like Potato Kurma, Chicken Kurma, and Cucumber raitha or Bottle Gourd Raitha. What to serve with vegetable pulav? Best to serve for the lunches and as well as dinners. Another easy crowd-pleasing a recipe to make for the parties. Best to eat with simple raita or spicy cumin potatoes or Chettinad egg curry. The vegetable pulav is mildly seasoned and hence great to serve with any spicy side dishes of your choice. How does this taste like? This simple vegetable pulao tastes excellent without any massive list of spices. This everyday comfortable rice is made minimal in such a way that it should also delectable with very mild additives. This tastes magnificent with the pleasing flavor of the basmati rice and a hint fennel seeds aroma. 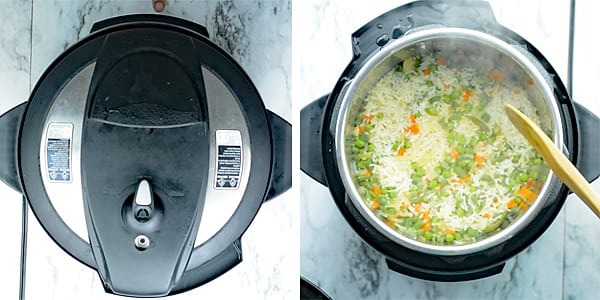 This Instant pot vegetable pulav is best to serve within 4 to 6 hours from the time of cooking. If you want to save for a longer time, you may refrigerate it in a sealed container. In the same way, you may store for up to a month, when it is frozen. If you’re planning to make vegetable pulav in the morning and wish to cut down the preparation time. Then you may chop the vegetables before the day. Alternatively, you may also use the store bought chopped frozen vegetables. I get a good quality of this chopped frozen vegetables from my local stores like Walmart, Wegman’s, Giant, etc. Getting these from the stores make the cooking possible effortlessly. This vegetable pulav is perfectly paired with a spicy curry or spicy stir-fried dish or gravies. It also tastes extremely good with chicken curry or goat curry. On the other hand, simple raita and a lemon wedge is the more satisfying sole mate for this. The water quantity and the cooking time I mentioned here for the white basmati rice. 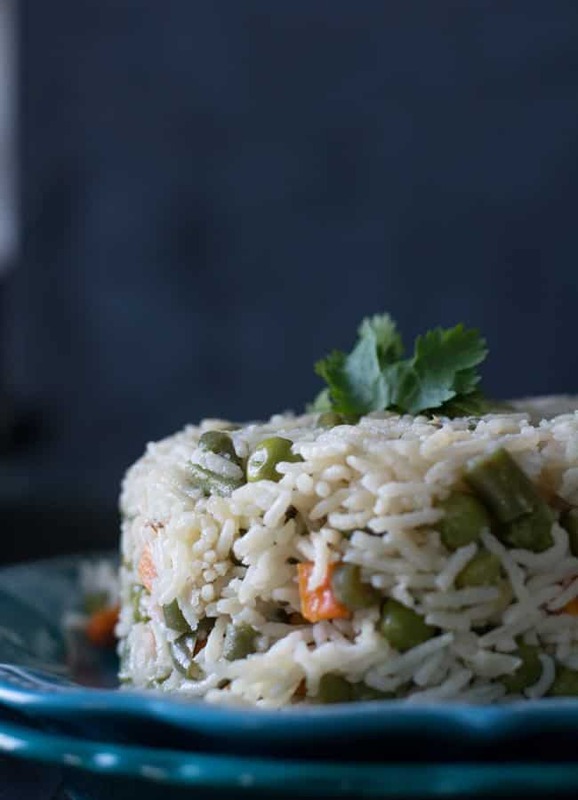 If you want to make this vegetable pulav recipe healthier, you may also opt for brown basmati rice or brown rice or wild rice. Every rice variety has its own in cooking time and water proportion. So, keep those into consideration while substituting with white basmati rice. Few fennel seeds less than 1/4 teaspoon is excellent for making this recipe. In its absence, you may substitute with a small cinnamon stick or with the small bay leaf. 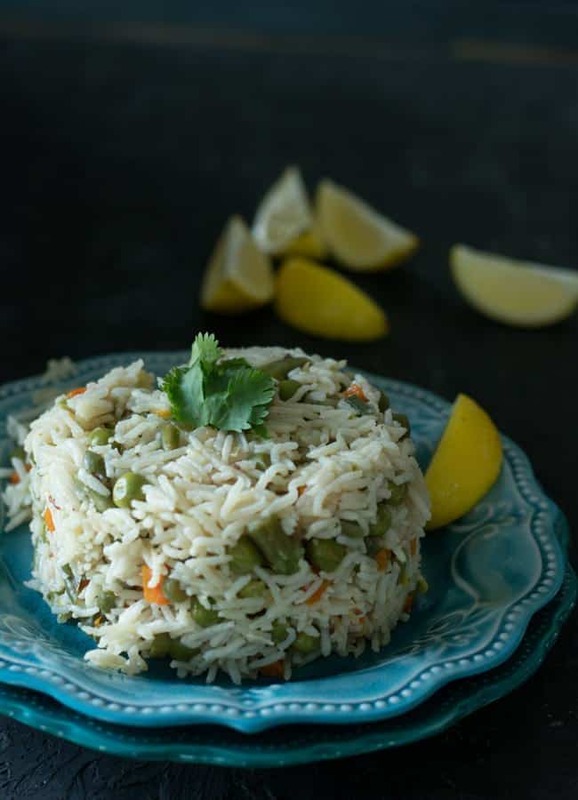 Fennel seeds added for its mildly sweet flavor, which perfectly enhances the character of the basmati rice. In this recipe, I have added a carrot, string beans, and green peas. These add appetitive color to the pulav. You may also substitute these vegetables with other vegetables like cauliflower, potato, sweet potato, turnips, beetroot, and so on. The choices are unlimited, and you can opt them according to your availability and your individual preferences. If your stores do not carry green chilies, you may use Thai Green Chili Peppers or serrano peppers. These are equally good with the same flavors. Start prepping the vegetable pulao by soaking the basmati rice. Ten minutes of soaking would be ideal, so plan accordingly. Clean and rinse the vegetables. Peel the carrots and the dice them into small size proportionate to the size of the green peas. Cur the string beans into the same size as well. Mince ginger and garlic. And slit the green chilies. You may add the whole chilies if you do not prefer the rice to be spicy. Set the instant pot to the sauté mode. Add the cooking oil followed by onion and fry them till it becomes translucent. Now add minced ginger, garlic, and green chili. And sauté them for a minute until it changes its color slightly. Now add vegetables and sauté for 2 minutes. Then add water, salt, and rice. Close the lid and set the cooking time manually for 6 minutes. Once the cooking time ends, quick release the steam. And open the top and give a gentle stir. Serve vegetable pulav hot with raita or egg curry. 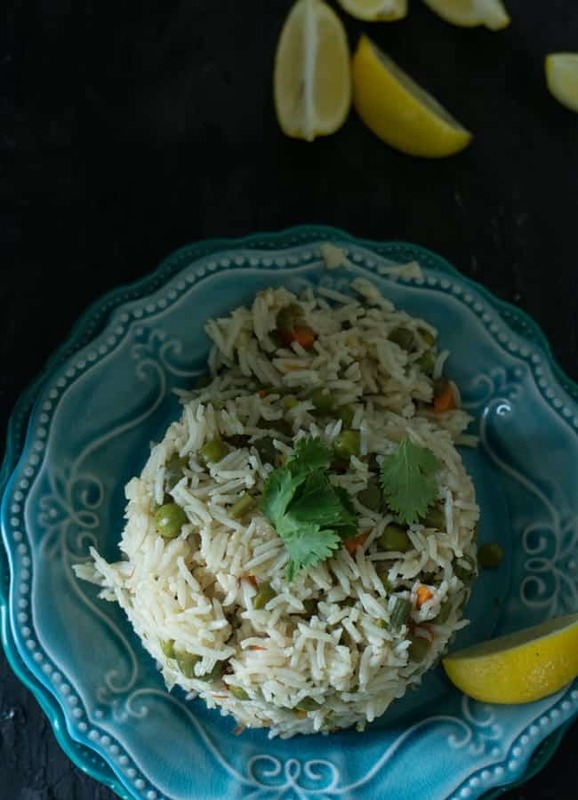 You make this Instant pot vegetable pulav within 30 minutes from scratch. A best comforting recipe to make for the lunch box in the morning busy hours. It is straightforward, just set the timer and start focusing on other stuff. Keep the instant pot in sauté mode. Add cooking oil and fennel seeds. Then add chopped onion and sauté till becomes pink. Add minced garlic, ginger, and green chilies and sauté further until it changes its color slightly. Then add chopped vegetables and sautéed for 2 minutes. Stir in water, salt, and the basmati rice. Close the lid and set cooking time for 6 minutes. Once the cooking cycle is over, quick release the steam. Open the lid and give a gentle stir. Do not forget to check out another recipe for Capsicum Rice, here in PepperBowl.